Bookmarks (also called favorites in Internet Explorer) let you visit your favorite webpages with one click. The easiest way to create a bookmark for the page you're on is to click the icon in the address bar. The bookmark for the page is placed on the bookmarks bar at the top of your browser window. You can also click the wrench icon and find it in the bookmarks menu. Click the bookmark to open the page in your browser window. - Edit the bookmark label in the "Name" field. - By default, the bookmark is placed in your most recently used bookmark folder. You can use the "Folder" menu to choose another location. Bookmarks can only be in one folder at a time. 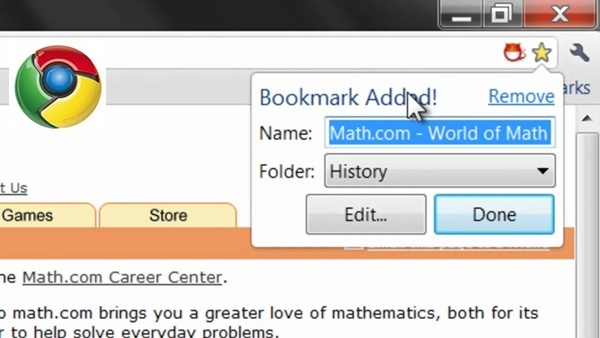 - If you created the bookmark on accident, click Remove to undo the addition of the bookmark. - If you want to tweak the bookmark's URL, click Edit. Otherwise, click Close to add the bookmark. - Import bookmarks from other browsers. You can export bookmarks from other browsers as HTML files and import them into Google Chrome. - Manually add a bookmark. Right-click (or control-click on a Mac) the bookmarks bar and select Add page. - Drag a link from the page you're viewing to the bookmarks bar to create a bookmark for the link. - Drag the icon next to the URL in the address bar to the bookmarks bar to create a bookmark for your current page.